TRENTON, N.J. — Gov. Chris Christie on Tuesday proposed a $33.8 billion state budget for the fiscal year that starts July 1, including no tax increases and flat spending for key items such as aid to schools, but that does not respond to a judge’s ruling from a day earlier that calls on the state to put an additional $1.57 billion into the pension funds for retired public workers in the current fiscal year. Christie, a Republican who is considering a 2016 presidential run, is appealing that ruling. If he does not prevail, it would mean major cuts to the budget. “Obviously, finding $1.6 billion dollars in the state budget in the remaining months of the current fiscal year would be, to put it mildly, a challenge,” state Treasurer Andrew Sidamon-Eristoff told reporters in a briefing before Christie’s budget address. And it could get even worse: Under a 2011 agreement, the state is on the hook for about $3 billion in pension fund obligations — more than twice the $1.3 billion Christie proposed on Tuesday. Sidamon-Eristoff said that Monday’s opinion from Judge Mary Jacobson referred only to the obligation for the current fiscal year, not the coming one. Christie focused his speech on an overhaul of the pension and health benefits system for the second time since he took office five years ago. Part of his plan calls for having the New Jersey Education Association take ownership of a new pension plan for educators. The state would be required by a constitutional amendment to fund its current obligations over the next 40 years. 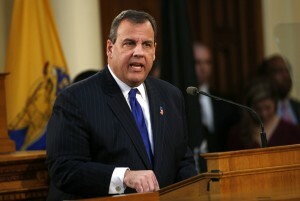 He announced that the NJEA has agreed to a “roadmap” for the plan. “I know we can get this done. We have proven time and again that even when we look like we’re not going to make it work and that politics and partisan interests have won, we flip the script. We do it differently. We get it done,” Christie told the Democrat-controlled state Legislature during a speech in which he expressed displeasure with previous governors, the courts, and the Legislature regarding the state’s pension predicament — and the media for the way it’s characterized. The NJEA’s executive director, Ed Richardson, told The Associated Press the group has agreed only to the concept of finding long-term pension fixes, not to many of the specifics Christie outlined. “We’re trying to get to a place where we can come out of this with a secure, reliable retirement benefit for our members as well as other public employees,” said Richardson, whose group has often been a prime foil of Christie’s. Another public workers union said it was not prepared to make a similar deal. “While we would support analyzing a labor-management approach to govern our pensions, we will never support freezing pensions for our members who have continued paying their required pension contributions while government has skipped their legal responsibility to do so,” said Patrick Colligan, president of the New Jersey State Police Benevolent Association. Christie will kick off a town hall tour Wednesday in southern New Jersey to sell his plan. During his speech, Christie did not announce a plan for another major financial issue facing the state: How to pay for road and mass transit improvements as the state’s Transportation Trust Fund is under serious strain.